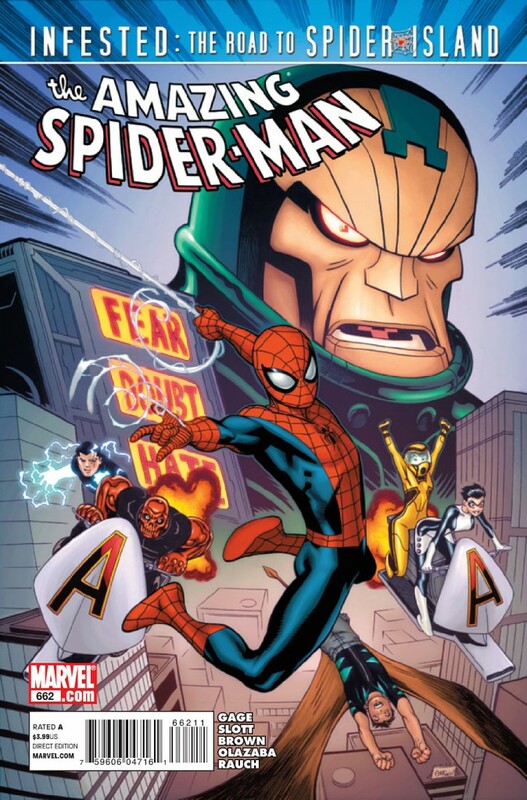 At the risk of having this post sound more like a review than a meditation, I thought I’d kick things off by saying the two-part Spidey teaches the Avengers Academy arc ultimately left me feeling flat. 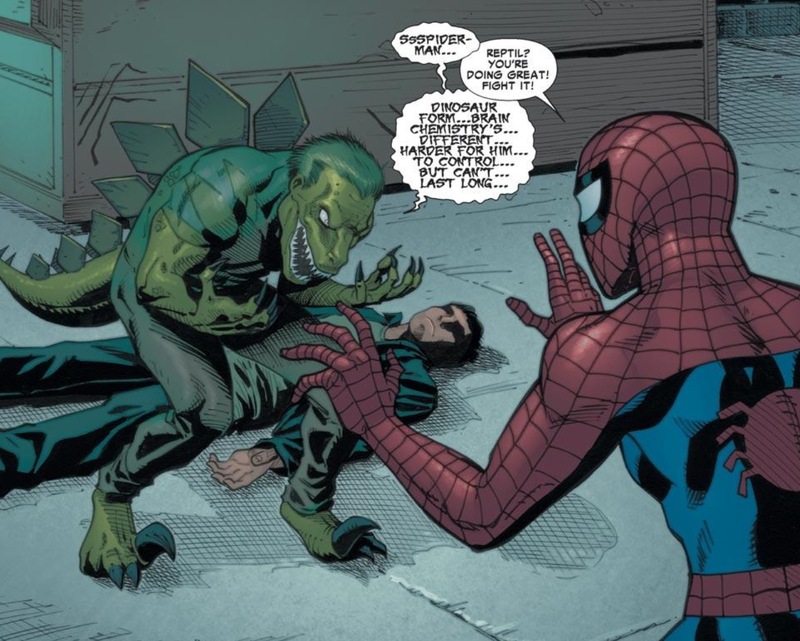 As I mentioned about ASM #661, as a concept, I love the idea of Spider-Man the teacher, especially for a group of young, up-and-coming heroes who essentially need to be “normalized” after being tortured by Norman Osborn. Spider-Man/Peter Parker is probably the best candidate in the entire Marvel universe to do this, as he’s a perfect combination of both brilliance and youthful exuberance. My problem with the resolution of ASM #662 is that the content was tap-dancing on the line between inspirational and preachy, falling more into the latter than the former. On one hand, I obviously love it when the creative team behind ASM acknowledges the fact that Spider-Man is awesome – a real character under the mask, with real life problems, who’s overcome more adversity than humanly possible. But in ASM #662, Spidey’s awesomeness just seemed to be played with the subtlety of a jackhammer breaking up concrete in a library. And obviously, watching Spider-Man overcome the odds is always more satisfying when the consequences seem greater. 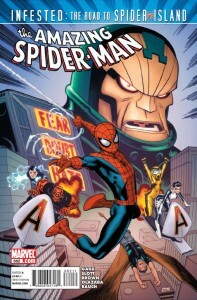 Thinking back to some great inspirational moments in Spidey history, watching Spider-Man in this issue tirelessly work with these kids to overcome the brainwashing of a relatively minor villain in Psycho Man just doesn’t stack up to when Spidey lifted tons of machinery off his body in order to save his Aunt May from illness, or his epic fights against ungodly powerful villains like Juggernaut and Morlun. Yet this entire issue is built around the idea that Spidey is up against some epic circumstances – these powerful but inexperienced hero-kids have been turned against him and he’s got to keep them from hurting themselves or random civilians and overcome Pyscho Man’s mind control even if he has to “die trying.” The whole thing just rings a bit manufactured for me. Of course on the flip side of this argument is the idea that for these Avengers Academy kids, this fight with Psycho Man is their “if this be my destiny” moment. And it’s Spider-Man who helped them overcome their self-hatred and doubt. It’s their first real test in the world of heroes and villains, and despite nearly being outmatched by an adversary with mind control abilities, through perseverance and self-confidence, they overcame the odds. And as mentioned before, there’s no one who’s more familiar with overcoming the odds than Spider-Man, who in addition to numerous near-death experiences, has also had to overcome a lifetime of doubt and self-confidence issues, just about his role as a superhero. And just like that, they overcome the odds. 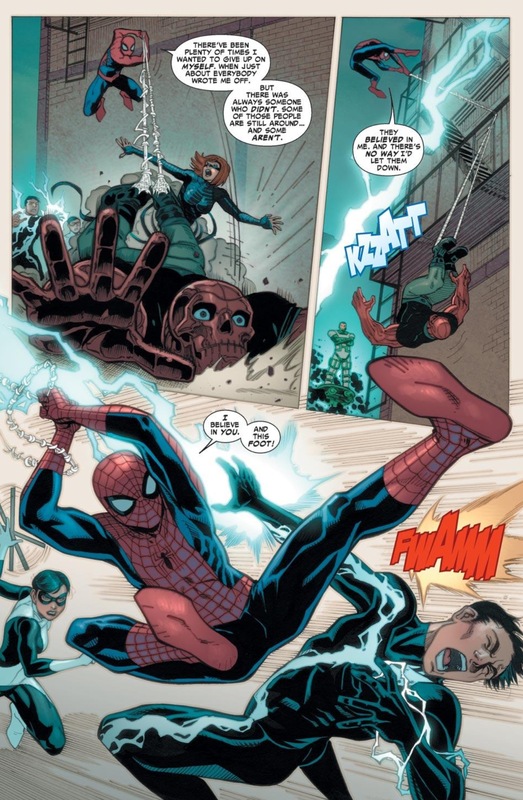 Yes, Spidey would have been tortured if these kids went out there and inadvertently hurt or killed an innocent bystander because they were under mind-control, but I just never felt any real push-pull struggle here. Also, this is Pyscho Man we’re talking about – someone who’s claim to fame is his grip on a microscopic universe known as the Microverse. This isn’t a hulking presence like Venom or Juggernaut or the crazed instability of a Green Goblin or The Lizard when he’s in his reptilian form. 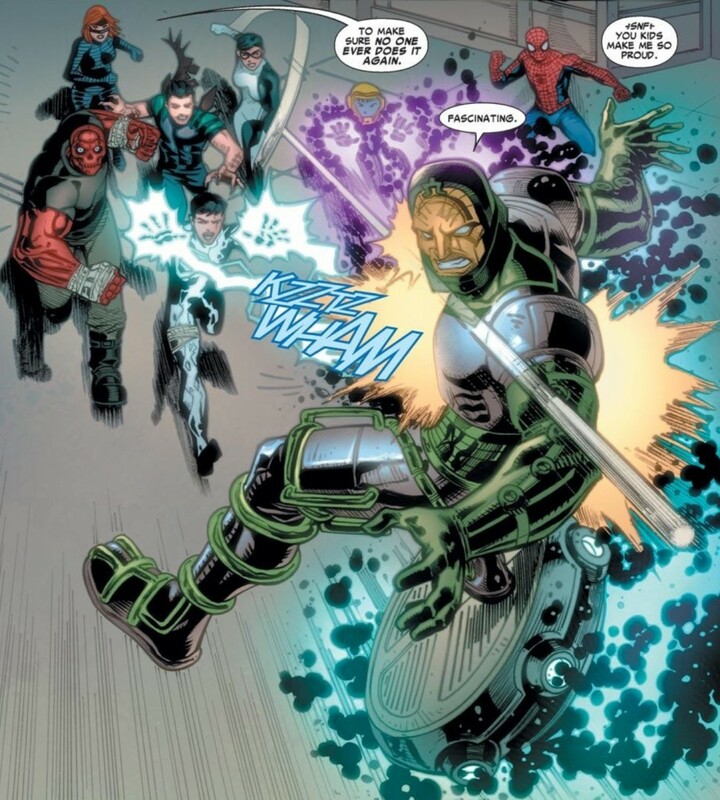 As a longtime Spider-Man fan, I can’t expect to buy that Pyscho Man is going to succeed in a way that might haunt Spidey for the rest of his life. Yet the creative team tries so hard to get us to believe it. Points for trying, I guess. 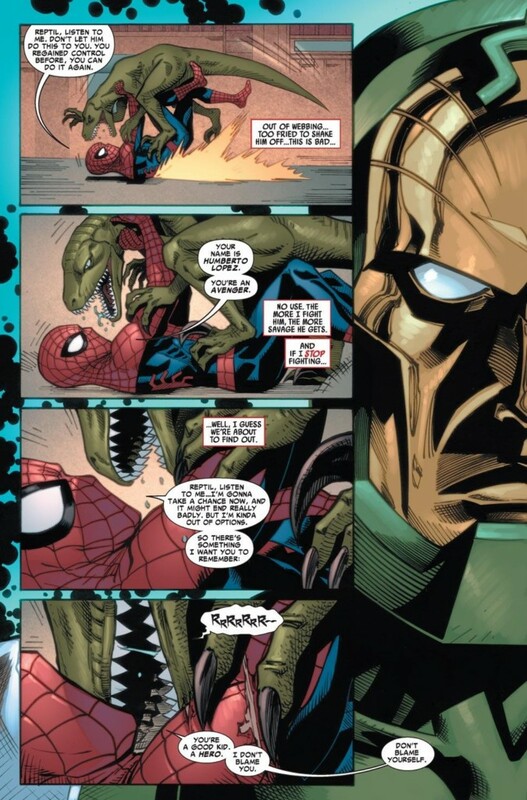 That’s not to say I wouldn’t be interested in seeing writer Christos Gage tackle some future issues of Spidey. Anyone who can throw out there, “There were times I wish Uncle Ben had told me ‘with great power comes pie,’” obviously has a great sense of humor. But considering the past two issues were the comic book equivalent of running in place until the Anti-Venom and Spider Island arcs take off in the next few issues, it’s hard to take the stakes being raised in ASM #661-662 as anything truly serious or epic. Or inspirational for that matter either.